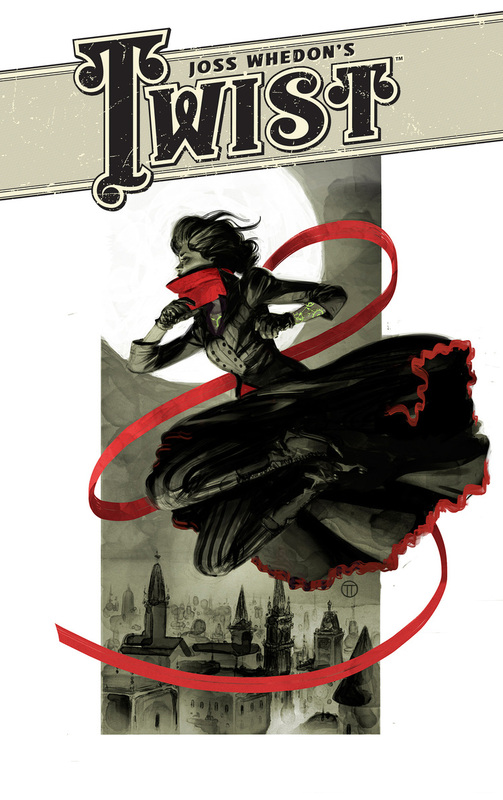 Joss Whedon, the director of Marvel's Avengers and the creator of Buffy the Vampire Slayer, is getting back into comics with an unexpected "Victorian, female Batman" steampunk miniseries for Dark Horse Comics, Twist. “It’s a Victorian thriller about a meek chambermaid who is fed to a dark horror — but instead of dying, she returns, with knowledge, power, and rage she can neither deny nor control,” Whedon told EW in a statement via Dark Horse. Expect a strong steampunk aesthetic, some dark knight thematics, and Whedon’s typically imaginative, provocative approach to political, social, and feminist concerns. Whedon has for years written or helped produce a line of Buffy comics for Dark Horse but with his busy filming schedule he hasn't consistently written a series since Astonishing X-Men in 2004. With Whedon famously out of his deal with Marvel Studios he now has the time to devote to a passion project like Twist. Besides the sample cover provided above there's no regular artist attached to the six-issue mini yet or a release date. We'll keep you updated. Are you excited for an original comic book series from Whedon?